In light of a recent undercover operation, which revealed an overseas business man was making millions off UK residents with spam text messages about PPI, is it time we looked at the way Claims companies treat people? Canary Claims do not use spam text messages and only react to genuine claims resulting in happy customers. But this use of spam techniques does tarnish more reputable PPI Claims Companies with the same brush. PPI Claims companies in the UK know that millions of people all over the UK are actually entitled to claim back mis sold PPI, however this is no reason to bombard every person in the UK with a hard sell similar to that of the banks and lenders who mis sold the PPI in the first instance. In any industry you will get good and bad companies and unfortunately PPI claims companies have received some criticism over the past few years due to unethical techniques. However, using a claims company can increase your chances of reclaiming the full amount plus interest and takes a lot of the stress and pressure off making a complaint. There are a lot of very good PPI claims companies and at Canary Claims we pride ourselves on having reclaimed millions for our happy customers. We only take on your claim if we feel we can win it and have a no win, no fee, policy [Cancellation charges may apply only if the claim is cancelled after the 14 days cooling off period. The fee would be based on the work done at the time of cancelling at a rate of £120 per hour and up to a maximum total of £180] with no hidden charges. 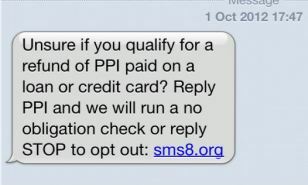 Have you received a text message about PPI? If you have received an unauthorised text message about PPI (by unauthorised you have not given your number to a PPI company to enquire) then do not text back, just delete the text message and ignore. By responding to these text messages some unethical companies are then selling your numbers to less reputable PPI claims companies. This practice is actually illegal but the companies that text out and sell your phone number are based overseas so at the moment they cannot be held accountable.